Leonardo DiCapprio plays Dominic Cobb, a man who is able to enter the dreams of others in order to steal ideas - a method called extraction. For reasons that we do not fully appreciate at the start, Cobb is a wanted man who cannot return to the US and, as a result, cannot see his two young children. So when Cobb is given the opportunity to have his record expunged, he takes it. All he has to do is plant an idea inside the head of another man (so that he feels that this idea is his own) - a method called inception. So that will be simple then! Confession time. This wasn’t the first time that I started watching Inception. I tried a year or so ago but, being really tired, I felt that I rwasn’t in the appropriate mood at the time to keep up with a film of this nature. So, I stopped. 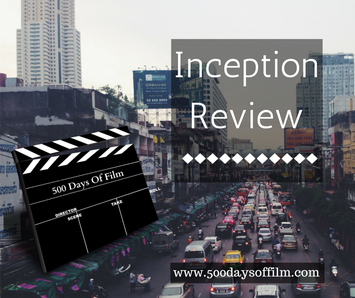 As a result, when I decided to take on my 500 Days Of Film challenge, Inception was top of my list. After all, how could I ignore one of 2010’s best films? I felt really excited and made sure that I was sitting up straight and fully alert. And I was gripped from the very first scene. Yes, the film is complicated but not overwhelmingly so - it just credits you with some intelligence and asks you to do some work in keeping up (no irritating exposition here). The concept, of course, is amazing. That the action takes place within the dreams of others gives the film an enormous sense of potential - anything goes here. The visual effects (both CGI and mechanical) are just fabulous. I felt that it was okay to feel a bit lost in the story while trying to hold onto all of its different strands. After all, the film’s characters are in the same boat (so to speak). The cast is so strong and each character gives a truly powerful performance. Inception is another film that will stay with me for a long long time. It felt good to see a film that had the perfect balance of action and intelligence. I wish there were more just like it. Until then, this film certainly bears repeat viewing! Go see it (or see it again!) and let me know what you think of Inception! I am sure that I am not alone when, during different parts of the film, I started counting the dream layers in order to (try) to keep a grip on reality. I remember watching Inception - a very rare chance to get to the flics. Brilliant film if you can keep up with the world within a world layers, paricularly at the end! In the same way as the Matrix, it questions what is actually reality. Must watch this one again.